What's Happening With London Stone? Londonist What's Happening With London Stone? The stone in its current cage. The setting on Cannon Street. London Stone's new home? 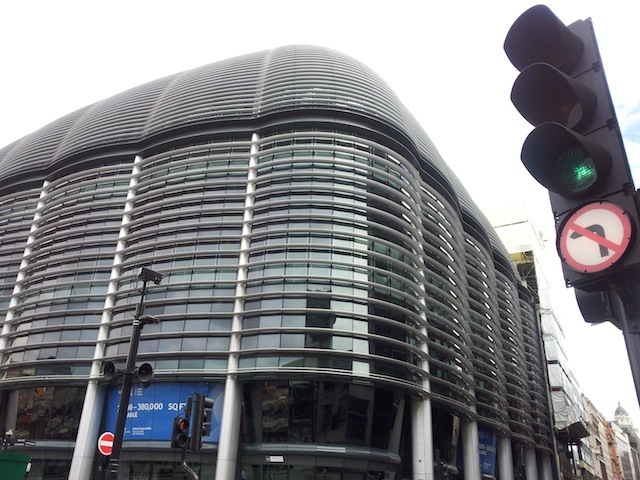 The Walbrook Building. In the year of the London Olympics, one of the city's oldest landmarks is languishing in the doldrums. London Stone (it shies away from the definite article) is an ancient rock that has probably been a feature of London since Roman times. 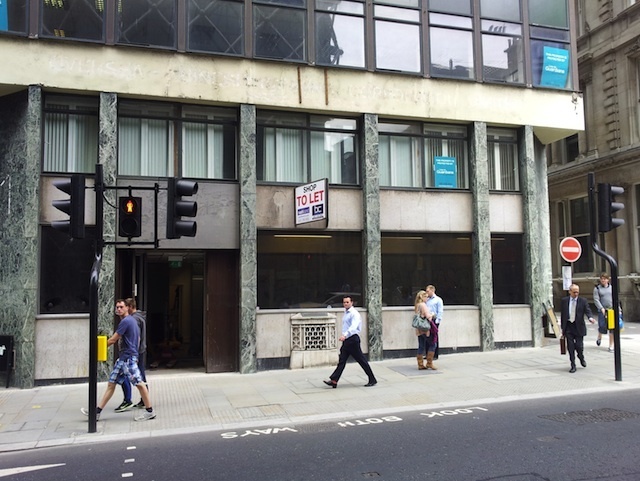 It is housed in a grimy case at the front of an ugly 1960's building on Cannon Street. The new-look Cannon Street Station gleams across the road, while London Stone sits unlit and unloved in its cage, as workers rip apart the building above it. It's hard to tell if this uneven chunk of limestone is even still there. It's the latest indignity in a long and sporadically glorious history. 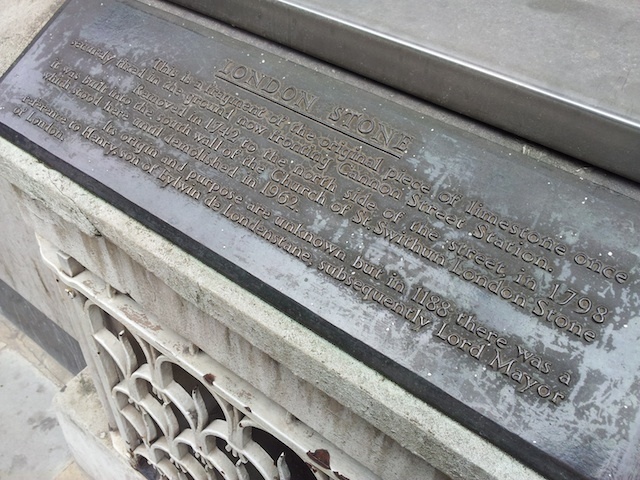 The first reference to London Stone dates from the 10th Century, but its origins are thought to go back much further. Brutus, the mythical Trojan founder of Albion, is said to have used the Stone as an altarpiece in his temple. Don't put much store in this tale, though: Brutus's connection with the Stone was first suggested in the 19th Century. It's more likely it is a Roman millarium, or milestone, used to measure distances, or possibly a fragment of a Roman building. Over the years, London Stone has worn down and lost weight. It was gloriously referenced in Shakespeare's Henry VI Part 2, but by the 18th Century it was known more as a traffic hazard. The Stone was moved back and forth across Cannon Street, and eventually ended up in St Swithin's Church, until the building was bombed in World War II. Since the early 1960s, the Stone has been housed at street level in an office building, the ground floor of which was, until recently, a sports shop. Now Minerva, the company that owns the building, and describes itself in a planning application as the "current owner/custodian" of the Stone, wants to move it to a special display outside its offices (artist's impression; PDF) at the super-modern Walbrook Building, just down the road. "The new dedicated setting will enhance the significance of the asset and better reveal its significance for current and future generations," the company said in its proposal in August 2011. While there is precedent for moving the relic, critics say Minerva's plans would remove the Stone from the fabric of the City streets and make it little more than a lobby decoration. "Minerva's grand design finally removes London Stone from the built environment," blogger Diamond Geezer wrote when the plan was announced. "It'll become a showcased exhibit — an ancient relic in a glass cage — rather than part of the everyday fabric of the city." English Heritage are inclined to agree. "We would question the concept of displaying the Stone at a new location and in a raised position within a modern glass case," EH told us. "In our view, this would harm the significance of the Grade II* listed object, and there are no public benefits to the proposal that outweigh this harm." "Our preference would be for the setting and presentation of the Stone to be enhanced once the current building at No. 111 Cannon Street is redeveloped. At present, we are not convinced of the justification to remove the Stone to its proposed position in the Walbrook Building." While everyone agrees the Stone's setting could be improved, the plans for its relocation seem to be stuck in a sort of planning-permission hell. At one point, the Museum of London offered to give the Stone a temporary home, but this idea seems to have fallen by the wayside. "A safe home was offered temporarily for the Stone should it be required," the museum told us. "Currently the scheme appears [to be] to take the Stone directly to its new location." For its part, Minerva says it wants what's best for everyone. "We are acutely aware of the historical significance of the London Stone and we want to ensure that it is preserved appropriately for future generations," it says. "We are currently consulting with all stakeholders. Through this, a number of different views are coming forward which we will take into careful consideration over the coming months." So, to recap, it's a misshapen lump of rock, of uncertain origin, worn down over the centuries, overlooked and now stuck in a bureaucratic limbo. But it's our misshapen lump of rock. 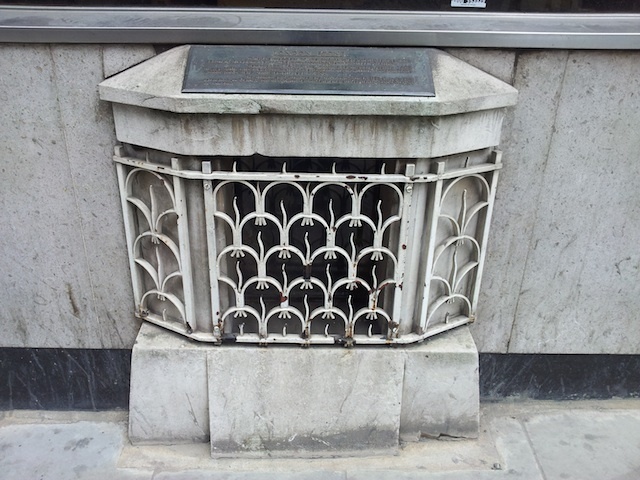 What a shame, with all the sprucing up the capital has seen this year, that London Stone hasn't had any Olympic love. It's old enough to remember the ancient Olympics, and it deserves better.